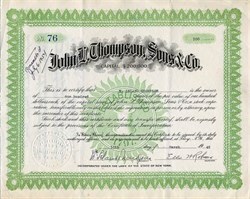 Beautifully engraved certificate from John L. Thompson, Sons & Co. issued no later than 1945. This historic document has an ornate border around it with an underprint of a Mortar and Pestle. This item is hand signed by the Company's President ( W. Leland Thompson ) and Treasurer ( Ellis Howes Robison ) and is over 50 years old. John L. Thompson Sons & Company traces its origins in Troy back to 1797 when Dr. Samuel Gale Jr. opened an apothecary shop in the city. John L. Thompson joined the business in 1881, and his name was added to the firm in 1821. In 1841 the business became John L. Thompson & Company. The business was primarily engaged in the wholesale drug trade, but also manufactured some patent medicines. The firm went out of business in 1990. History from the Rensselaer County Historical Society. E.H. Robison was from Troy, New York. Mr. Robison was president of John L. Thompson Sons and Company and a former president of the Board of Trustees of Albany College of Pharmacy of Union University. The Niemand�Robison Softball Field at Cornell is partly named after Ellis Howes Robison, a Cornell University Alumni.